Ozhotels provides business and leisure travellers with a directory of independently owned and non-related hotels and serviced apartments providing accommodation in Docklands, Melbourne. Oz hotels allows you to deal directly with the hotels and apartments in Melbourne's new Dock Lands Waterfront Precinct, hence giving you the best possible rates for this Docklands accommodation. Book your accommodation online directly with the hotels in Docklands, Melbourne and receive discount rates for longer stays !!! Docklands is a fantastic new waterfront precinct situated on the western side of the Melbourne CBD. 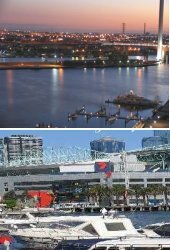 Docklands comprises the waterways of Victoria Harbour and three kilometres of Yarra River frontage and is similar in size to the Melbourne CBD. Docklands is divided into precincts, each of which has its own blend of residential accommodation, retail shops and commercial activities. This approach ensures that Docklands develops into a vibrant and diverse suburb while still retaining its attraction as a visitor destination. NewQuay, Waterfront City and Melbourne Central City Studios make up the northern precinct of Docklands. The central precinct of Docklands is made up of Victoria Harbour with its distinctive peninsula and Central Pier. The Stadium precinct is home to Etihad Stadium, while closer to the CBD is the Watergate apartment accommodation complex and Village Docklands. The southern precinct is home to Yarra's Edge, which runs along the Yarra River. Melbourne Docklands is where the city meets the water and this prime waterfront destination showcases the very best that Melbourne has to offer including world-class restaurants and stylish cafes combined with a subtle fusion of historic and contemporary architecture. Docklands central location makes it easy to get to by car, train, tram, ferry or on foot. Five city trams as well as the Free City Circle Tram travel regularly to Docklands via Flinders, Collins, Bourke and Latrobe Streets. The Docklands Prestige Apartments is a stylishly appointed 4.5 star accommodation that is perfectly located in the newest waterfront precinct of Melbourne, Docklands. These luxury serviced apartments provides a range of beautifully furnished one and two bedroom apartments with all of the facilities that you would expect from a Prestige Apartment. 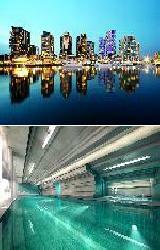 This Docklands accommodation includes internet access, gymnasium, heated swimming pool and open garden area. Guests staying at the Docklands Prestige Apartments can also enjoy the lively atmosphere at the James Squire Beer House, Lounge and Quay Bar or relish the fine dining at the 24 waterfont resataurants. This makes the Prestige Apartment accommodation in Docklands ideal for both long and short term stays for either business or a relaxing holiday. 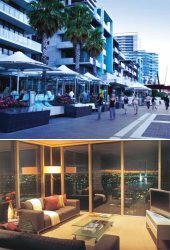 With a wide variety of different studio, 1 & 2 bedroom fully self-contained apartments the Sebel Melbourne Docklands provides corporate and leisure guests with stylish and spacious accommodation that is ideally located on the New Quay waterfront in the heart of the Melbourne Docklands precinct. The Sebel Melbourne Docklands are situated close to the Melbourne CBD, Etihad Stadium and 5 minutes drive from the famous Queen Victoria Market. The Sebel Melbourne Docklands in Docklands is close to everything else that the city has to offer, as well as having a numerous guests facilities and services including business centre, conference centre, disabled facilities, faxing facilities, fitness equipment, lift, indoor swimming pool, 24 hour reception, baby cots for hire and a large range of business facilities for the corporate traveller. The Grand Mercure Docklands Apartments provides holiday makers, families relocating and business travellers with a wide variety of quality 1, 2 and 3 bedroom serviced apartment accommodation in Docklands. Beautifully appointed and conveniently located in the heart of the Docklands precinct the Grand Mercure Docklands Apartments really does have something for everyone including a 24 hour reception, broadband internet access, outdoor heated lap pool, gymnasium and even a business centre. Stay in this luxurious apartment accommodation in Docklands and you will be close to Telstra Dome, Spencer St train station, New Quay Promenade, Crown Casino as well as a multiptude of restaurants, cafes and bars at your doorstep. Guests truly can experience Docklands accommodation close to the city in style at the Grand Mercure Dockland Serviced Apartments. Docklands Executive Apartments is situated between Collins and Bourke Streets, in one of Melbourne's most prestigious inner suburbs only minutes away from the CBD. Docklands is home to some great entertainment, restaurants, shopping experiences including Harbour Town, South Wharf DFO and Spencer Street Fashion Station. The Docklands Executive Apartments has numerous guests facilities and services including gym & fitness equipment, lift, restaurant, sauna, spa, outdoor swimming pool, atm, airport shuttle and baby cots available. The award winning quality built apartment complex has security access, intercom security and undercover security parking, centrally located to trains, trams and ferries. 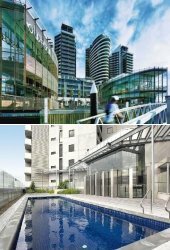 The Apartments Melbourne Domain Docklands are perfectly situated in New Quay, which is conveniently located on Victoria Harbour in the heart of Melbourne's premier water front precinct, Docklands. Situated opposite the Telstra Dome Stadium, New Quay is an easy walk to the city centre and is also well serviced by Melbourne's trams, trains and water transport. 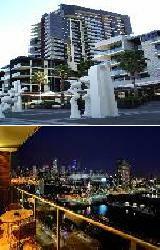 The Apartments Melbourne Domain Docklands are central to all of the major tourist attractions including sporting stadiums, Crown Casino, nightlife entertainment, Exhibition Building, markets, restaurants, cafes, theatres, galleries and shopping. 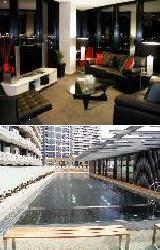 This really is the ultimate in fully self-contained luxury corporate and family apartment accommodation in Docklands. The Apartments @ Docklands Accommodation offers luxury waterfront 1, 2 & 3 bedroom self contained serviced apartments located in stylish New Quay, Docklands, which is just a short walk to the Melbourne city centre. The Apartments @ Docklands offers guests a range of luxurious one, two and three bedroom self contained serviced apartments, which provides all types of travellers with accommodation in Docklands at discount rates. It also features a wide range of modern amenities and services such as direct internet access, gym & fitness equipment, lift, massage, restaurant, outdoor swimming pool, baby cots and babysitting service to ensure that guests continue to experience the highest level of service, quality and assurance time and time again.